Singapore has always been a travel-hop and a business hub. There is more to Singapore than just concrete jungles and a mix of several cultures. There are plenty of freebies available to check out in this region which would be easy in your pocket. We have a list of your favorite freebies based on which you can decide where to go in Singapore. Each place has its own charm and offers a distinct feel and experience with so much on offer. The national museum of Singapore is home to 11 national treasures have a large variety of exhibitions and events all through the year. With an entry fee of just $10, it is easy on every pocket to see this amazing place where you get information about the history and traditions of this wonderful country. There are several events and exhibitions which take place in the museum all through the year. This has to be on your list of places to visit in Singapore. There are free tours in English, Japanese, and Mandarin on all days except for public holidays. The Marina Bay Sands Hotel is one of the most beautiful constructed hotels in Southeast Asia. The observation desk located on the top of the Marina Bay Sands Hotel allows you to view a 360° view of the entire city. On some clear days, parts of Malaysia and Indonesia are also visible in addition to the amazing view of the Marina Bay and the CBD. The entry fee is for $20 which gives you access to the observation desk and you would experience the stunning view of Singapore. 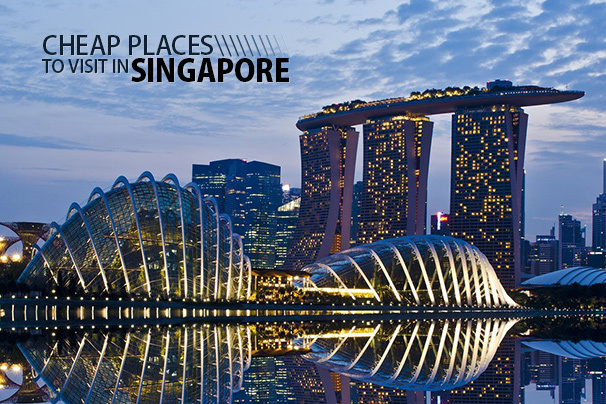 We would definitely recommend this as one of the places to visit in Singapore. This trail is spread over 3 parks and 9km in length is a wonderful place as you stroll along the forests admiring the amazing view of the Sentosa on one side and Little India on the other side. The Henderson waves bridge is the highest pedestrian bridge in Singapore and is 8 meters wide and 274 meters long. This amazing architectural structure is built using the theme of the mathematical SIN wave. You will definitely be satisfied with this wonderful and amazing view of the city. Reaching out to this place is easy and very cheap. You can easily reach Sentosa by just walking across on the Sentosa Boardwalk. There are plenty of modes of entertainment on Sentosa. Enjoy the ride from Luge to the Universal Studios. There are several free attractions. There is a crane dance organized every day at 9 pm followed by Lake of Dreams show at 9:30 pm. You can even relax and enjoy the waves at the Wave House Beach Bar. There is plenty on offer to enjoy this wonderful location without spending a fortune. With an area of 185 hectares, this is Singapore’s largest park which is built on reclaimed land. There are several activities in store for the budget traveller. You can enjoy the delicious street food at the East Coast Hawker center or enjoy watching people wakeboard on the lagoon at Ski 360° or simply take a walk along the beachfront stopping for a gateway or stop at one of the several BBQ pits to enjoy a mouthwatering barbeque dish. This definitely has to on top of your cards on the places to visit in Singapore. There is no entry fee to enjoy the healing gardens spread across the rainforests and 3 lakes, etc. you will have to pay $5 only at the Orchid Garden. Walking through this lush green environment will revitalize your senses and refresh your sensory moods. You will definitely fall in love with the Changi airport in Singapore. There is a butterfly garden or relax in the massage chair or enjoy the free Wi-Fi or chill out the TV lounge. You will definitely find more reasons to delay your flight and spend more time out there. You can even book a free city tour if you have more than 6 hours to spare. The street food in Singapore is very hygienic and offers great taste with several local and international flavors and cuisines on offer. The Lau Pa Sat Hawker Centre is one of the key attractions for locals and tourists to enjoy a cheap and delicious meal. You can enjoy the wonderful street food with live music bands playing every Friday or Saturday night. Many hotels in Singapore have welcomed non-guests to view their timeless art collections. The Ritz-Carlton Millenia pampers the art lovers with their amazing collection. The enviable collection will definitely spoil art lovers with the likes of enormous Frank Stella to the Dale Chihuly glass blowings. If creative art is your forte, then this is definitely one of the things to do in Singapore. Get a taste of the new restored Peranakan history near Chinatown at the Baba House. Enjoy the free hour-long tour which gives you a deep insight into the life and history of the local wealthy family. The tours can be attended by prior appointments only. The scheduled tour runs every Monday (2 pm), Tuesdays (6:30 pm), Thursday (10 am), and Saturdays (11 am). Still wondering if a trip to Singapore would empty your pockets. So what are you waiting for? Apply Visa for Singapore to enjoy this wonderful destination. You can enjoy several freebies with the mix of cultures, traditions, and various backgrounds. You can apply for the visa even online, making it ideal and convenient for guests and tourists to visit this place. You can enjoy this wonderful destination with a fixed budget.